The video starts. Black background. Dark eyes. Long brown hair. A big smile. Warm and welcoming voice. – “On this independent broadcast, we will be talking about Jewish subjects, with no taboo, freely…and we hope… with respect.” Welcome to “Conversation Juives”. Sandra Jerusalmi was born and raised in the Parisian Jewish community and today she is both an activist and a Jewish community professional. Since childhood she has been involved with the youth groups, volunteerism and social activism. At just 19 Sandra was invited onto the board of her Synagogue. In her 20s she spent time in India as a volunteer in a Jewish community, and studied at Paideia in Sweden, as well as Matan, Pardes in Israel and Kaplan Fellows@ Yesod. Sandra is a resident of Moishe House and is currently working for the Alliance Israelite Universelle. She is also involved with the CCEEE, a Jewish community center that works to attract Jews who are unaffiliated with Jewish life, and she works with LectureSefer, which organizes Torah readings by Orthodox women. Last year, Sandra was approached by Michael Amsallem, the founder of the Facebook group “Judaism and Feminism” to take on another Jewish project. Inspired by a French-speaking media show in Israel Michael wanted to create an internet show that would start a conversation within the French Jewish Community, focused on the important and difficult topics people were not talking about. One of those subjects was, surprisingly, Jewish identity. As Sandra told me, “Jewish identity is what we do not talk about. We talk about Jewish religion, we talk about Jewish practice, we talk about what things are kosher and what not. But we do not talk about what big issues; about what it means to have only a Jewish father and not be accepted by the community.” Giving a voice to minorities and those silenced within the community, was one of the goals of the new project. 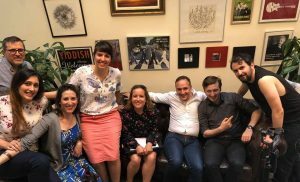 To create a show, you need a team and here it is a group effort, including Sandra, Michael, David El Shatran, creator of JewSalsa TV, and Emile Ackerman the founder of Ayeka association, a study circle and a Rabbinical student. The show they created together is called “Conversations Juives” (Jewish Conversations) and was made possible thanks to Michael’s private funds, the support of ROI, the network of young Jewish leaders from all around the world and the Schusterman Foundation. So far they have made three 50 minute episodes. The themes for the show are chosen by Michael, Sandra and Emile, who select topics that they feel are most pressing and may be connected to the more universal conversation about Judaism in France. So far, they have talked about the relationship between French Jews and Israel and, on the more local level, they discussed the challenges of women’s rights in divorce in the orthodox community. Last year, France was shaken by the news that in Grenoble the community put religious sanctions on a man who for years would not give his wife a gett (a Jewish divorce document). Conversations Juives are promoted only on Facebook. Each episode sparks a lot of comments and shares. Sandra and her friends want to support the grass-roots movements that exist locally. “We want to be better known to people, so that they could come to us. We want them to realise that we all share the same values and even if we are different we need to connect and help each other”. Because of the difficult subjects that the show covers and a very open mindset of its creators one might expect a backlash from the French Jewish Community, but so far there has not been any negative responses towards the show. “It might mean that we are not big enough yet”, Sandra told me. 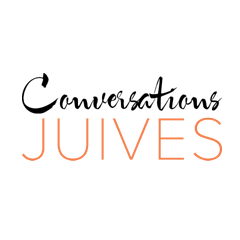 Conversation Juives is a volunteer, passion project; something they all do beside their work. Sandra wants to produce four episodes a year; one every season. The team is currently planning the next episodes of Conversation Juives and a long-term strategy that would allow them to work together even though they will be in different countries in the coming year. Cut. Black background. Dark eyes. Brown long hair. Big smile. Warm and welcoming voice “Thank you all for watching. Please continue to ask us questions, send us your suggestions of subjects that you would want us to talk about here at Conversations Juives. See you soon.” The video ends.